One of the best places in Hong Kong to have congee is Sang Kee in Sheung Wan. It's only open Monday to Saturday and there's often a line to get in. It has one main shop that is actually two giant rooms, and then down an alley is the original congee shop, where there is a giant vat where they make the rice porridge everyday. I was in the area today around noon and decided to hit Sang Kee for lunch and managed to walk in for a seat by the window. 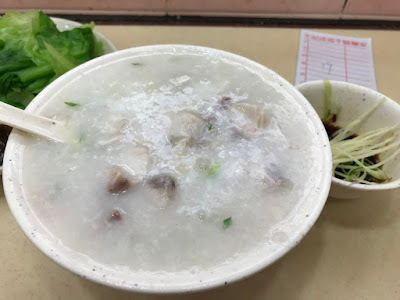 At first I was going to order beef brisket and noodles in a clear broth, but then changed my mind -- I'm trying to eat less meat -- so I asked for a small bowl of the sliced fish congee and a plate of poached Chinese cabbage. The congee here really is comfort food -- it's creamy having been simmering for hours, and it arrives piping hot. The fish slices had no bones in them, very thin and the congee had lots of thinly sliced ginger in it. It also comes with a small bowl of soy sauce with more ginger and spring onions. I dunked the ginger and spring onions in the soy sauce and put some in the congee to add a bit more flavouring as it's quite plain. So good! There were lots of fish slices in there that were tender and combined with the creamy congee and spiced up with a bit of ginger was a great combination. If you are a fish expert, the fish head congee is a favourite. A small bowl of congee was HK$32 and the plate of vegetables with oyster sauce was HK$19. When I was leaving, there was a line of hungry diners at the door.